ANN ARBOR, Mich., April 16, 2018 /PRNewswire/ -- Domino's Pizza (NYSE: DPZ), the largest pizza company in the world based on global retail sales, is launching yet another delivery revolution. Starting today, over 150,000 Domino's Hotspots are now active nationwide so that customers can receive delivery orders at spots that don't have a traditional address – places like local parks, sports fields and beaches, as well as thousands of other unexpected sites. Local Domino's stores around the country have selected these Domino's Hotspots, which are now locations where drivers can meet customers curbside to hand off orders. 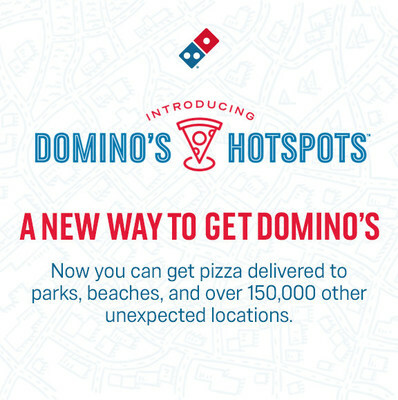 More than 150,000 Domino’s Hotspots are now active nationwide so that customers can receive delivery orders at spots that don’t have a traditional address – places like local parks, sports fields and beaches, as well as thousands of other unexpected sites.